Selling scrap metal on eBay is easy, and by allowing the market to set the price instead of a single scrap metal dealer, you can maximize your scrap metal profits. 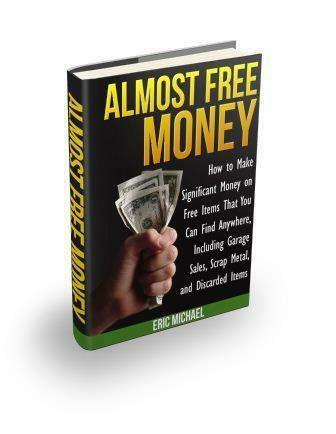 It is easy and profitable to sell scrap metal on eBay.Let’s take the process step-by-step. First, go onto the USPS website and order yourself a selection of Priority Mail shipping boxes. All of these boxes are free to order, and have no shipping charges. The USPS wants customers shipping items by Priority Mail, as it makes them more money than the same items shipped Parcel Post or First Class Mail. Get a variety of sizes of boxes, but make sure that you get the large regular Priority Mail and Large Flat Rate Priority Mail boxes, plus some smaller regular Priority Mail and Medium Flat Rate boxes. Once you get the boxes, start collecting your scrap metal in the Large Flat Rate Boxes, especially solid metal copper and brass. The copper box will probably contain copper pipes, ornamental copper items, and copper connectors, etc. The brass box could have ornamental brass objects, brass bullet casings, plumbing fixtures, etc. 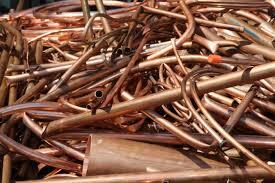 Once you fill up a Flat Rate box with one type of scrap, you are ready for selling scrap metal on eBay. Weigh your box with the metal contents inside it on a scale with a digital read-out. Take a digital photo of the scale, with the weight of the box displayed on the readout of your scale, so that your potential bidders on eBay can be confident in the accuracy of your auction. These potential bidders will be bidding based almost entirely on the weight of the scrap metal in the box, so they will want to be able to verify the exact weight of the product. Next, dump out the box on a flat surface and take some photographs of the contents. If you have ornamental items in your box, take additional photos of those items. Download the photos to your computer, and then log in to your eBay account. Go to the ‘Sell an Item’ page on eBay. There are two categories that you can sell scrap metal in: Coins and Paper Money, Bullion and Business & Industrial, Metals & Alloys. 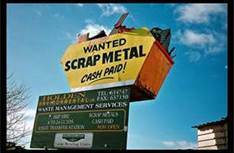 List your scrap metal in one of these two categories. Go to the photograph section and upload your digital photographs to your auction listing page. An example of a title I would use for my auction would be along the lines of: ‘24# (LBS) #1 SCRAP COPPER Bowls Pipes Decorations’. 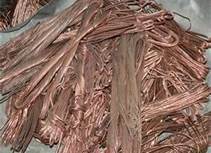 #1 Copper is the designation scrap dealers use for solid copper items, or large stripped copper wires with no insulation, and is the highest grade of copper. The additional descriptors may also get collectors of ornamental copper items to bid on your auction. Make sure that you are accurate in your description of the auction. Subtract the weight of the box when providing the weight (usually about 8 ounces for a Large Flat Rate box). Under the Shipping section of the listing, click on ‘Large Flat Rate Box’, and use the ‘Calculated Shipping’ option, with an additional 1-2 dollars added, so that some of your eBay and PayPal fees are covered by the shipping cost. List your auction. I like to start my auctions between 3:00 and 9:00 PM, as that as when the most users are on eBay. When the auction is complete, seal the Flat Rate Box, address it with the winning bidder’s address, and take it to the post office to ship it, or if you are already an internet seller, use your online shipping service and ship from home. Selling scrap metal on eBay is as easy as that! The one thing that affects which scrap materials to sell on eBay is the shipping cost. The more it costs to ship something, the less profit you will make on it. Bidders will decide whether to bid on your auctions based on the total cost of the item at auction, including shipping charges. The types of scrap that I have had the best luck with when selling scrap metal on eBay are high value scrap metals that fit well into a flat rate USPS box. I have consistently gotten more money on eBay than the going buy rate at my local scrap metal dealer for flat rate boxes full of clean copper tubing, clean lead, carbide tool scrap and clean brass, for instance. eBay allows sellers to list up to 50 free auctions a month, so set your start price on eBay at the buy price for your local scrap metal dealer, then let the bidders raise the price from there. Even if you only get one bid, you are still ahead, because you do not have to haul the box to the dealer. You have your mail carrier pick it up, by requesting a pick-up through the USPS website. I have also done well with box lots of e-scrap such as: gold circuit board fingers, green circuit boards, CPU’s, gold filled eye-glass frames, Memory RAM boards from PCs, aluminum heat sinks, hard drive magnets, catalytic converters, and other similar items from vintage computers and A/V equipment. I was surprised that a large box of mixed tan and green circuit boards from vintage electronics sold for $28. because there is such a minute amount of Platinum, but there are a number of completed listings on eBay, where the seller got $5+ shipping for 25 platters. I like to gather a large pile of vintage electronics, and disassemble them in one session, so that I end up with boxes full of similar items that I can sell on eBay. Research materials that do well when selling scrap metal on eBay by looking through Completed Auction Items, or by browsing categories like Coins:Bullion and Business and Industrial:Manufacturing & Metalwork:Alloys.